The most frequent question that we have been asked by homebuyers is whether they should buy a home or lease one. Unfortunately for somebody looking for a generally correct opinion, the real answer is completely dependent on each couple or individual planning a move. 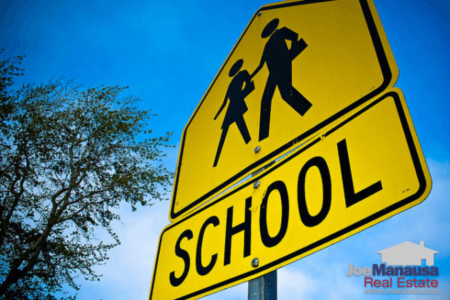 In fact, I wrote this article a while back to take our readers through a decision making process, so I won't re-address the topic in that manner. Instead, I want to drill down and answer a subset of this question that we also hear often, which is "how long do I have to own my home for it to cover the closing costs?" Homebuyers will pay closing costs when they buy a home, and they'll pay closing costs when they sell the home, so many people who know they will not live in Tallahassee forever want to know how long they have to own the home before they recapture their closing costs. 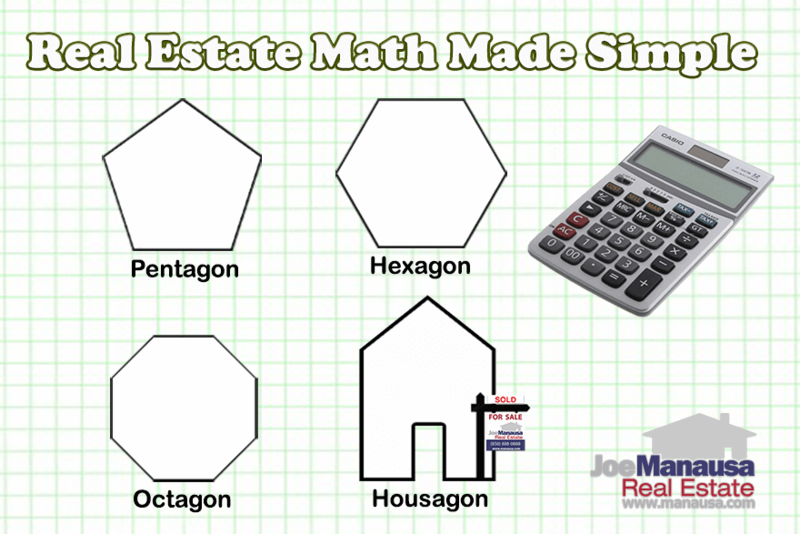 In order to properly calculate the time it takes for appreciation to overcome closing costs when buying and then selling a home, we have to develop a range for the key variables in the equation (appreciation rate, closing costs when buying, and closing costs when selling). Appreciation Rate: If you are reading this article several years after it was written, then it is likely that this variable is going to be over-stated (estimated). The long-term real estate appreciation rate in Tallahassee has been about 3.5% for single family homes, but current market conditions will always skew the current rate in one direction or another. For those of you who remember the housing bubble of 2006, then you know it's actually possible (though very rare) to have a negative rate (depreciation). But most periods in history show a stair-step rate that hovers around 3.5%. Currently, the housing market has inedaquate supply to meet the current and forseeable future demand, coupled with the rising cost to produce more homes for our growing population, thus we anticipate the next few years to continue the current trend of above-normal appreciation for single family homes. Buyer & Seller Closing Costs: I have chosen not to make these variables for the purpose of this analysis, but the reality is that these numbers will fluctuate due to the different circumstances that each individual will face. For example, one loan product might have a different set of closing costs than does another, and it might make more sense to increase your closing costs for the benefit of a lower mortage interest rate. 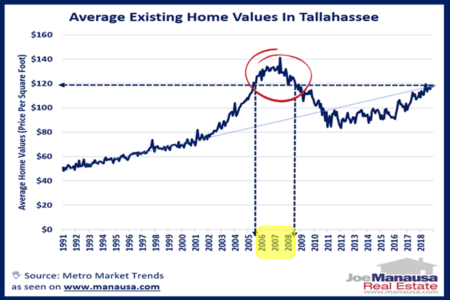 Rather than let these small fluctuations cloud the benefit of the analysis, I've used an average that we have consistently observed over the past (almost) 30 years of selling homes in Tallahassee. For the purpose of this analysis, we'll assume that when buying, you'll pay 4% in closing costs, and when selling, your total closing costs will be 7%. The appreciation rate in Tallahassee in 2018 has exceeded 10% for numerous neighborhoods, yet I would never recommend you purchase solely on the anticipation of appreciation remaining this high. I do believe we are very likely to see higher than normal appreciation rates over the next five years, so I have skewed the table in that direction. Bear in mind, this article will be available "forever," (we still get traffic and comments on articles written in 2007), so if you are reading this in 2023, the market might be indicating completely different trends. The table below shows a purchase amount of 100% and then calculates your post-closing equity for each of the next six years based upon five different appreciation rates (from 2% to 10% annually). Whenver you see the future "Net" exceed 100%, then you know that your closing costs will be recaptured by that time. The bolded amounts show when your post-closing equity will exceed your initial equity. For example, if you purchase a home today and the annual appreciation rate averages 2% (below the historical norm), then you will have to own it for six years before you will break-even (recapture) your closing costs. But if the annual appreciation rate is similar to what we've seen in 2018, then you'll recapture your closing costs after just two years! The best way to ensure you do not over-spend on closing costs is to hire a highly active, expert, real estate agent to walk you through the process of buying a home and then selling the home when the time is right. If you are wondering how to find the right agent ... my recommendation is to start on Google and find the agent with the happiest past clients. We encourage you to read what our past clients have to say. 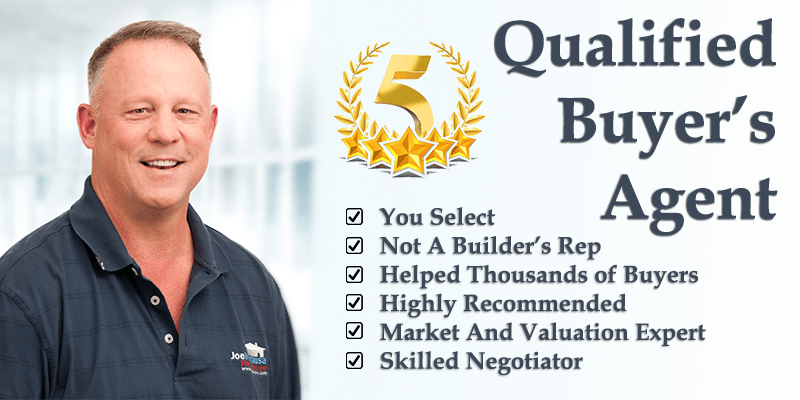 You can see thousands of real customer reviews reported on Google, Facebook and Zillow right here: http://www.manausa.com/testimonials.